I am currently reading through the « Life of Saint Kentigern » a 12th century account of the life of the patron saint of Glasgow, (also known as Saint Mungo). 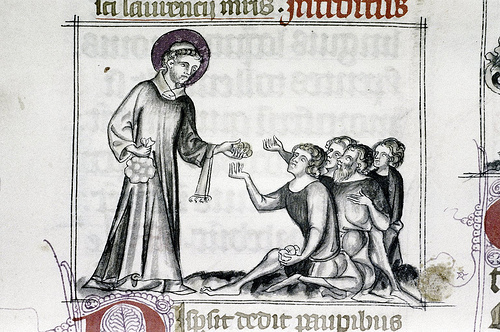 At one period St Kentigern was being given a hard time by King Morken, an irascible, greedy and godless man, who refused Kentigern’s many pleas that he should help the poor in his kingdom. All attempts to elicit support based upon Morken’s sense of Christian duty or feelings of common humanity having failed, St Kentigern tries a different tack. He reminds the king that, in fact, it is the rich who need the patronage of the poor, not the other way around. Kentigern makes the strongly supported biblical case for the fact that the rich need the prayers and intercessions of the poor before God. “He punishes them for their wickedness where everyone can see them, because they turned from following him and had no regard for any of his ways. God describes Himself as extremely concerned for social justice and very attentive to the prayers of the poor. Any cry they make towards Him, in response to their being oppressed and maltreated by the rich and powerful, is certain to be heard by Him. So God exerts a kind of two-pronged spiritual counterbalance in society. He firstly commands the rich to undertake their Christian duty of caring for the poor, the vulnerable, the unlucky and the under-privileged in society. Secondly, God operates a kind of checks and balances system through a sensitive ear to any complaints of the poor regarding their treatment by the rich. So, the very presence of poor people is an indictment to any society that they have failed to live up to God’s command and they therefore stand in danger of judgement. Given the social realities of contemporary society, an increasing gap between the rich and poor, the requirement for food banks, a minimum wage that is only just about enough to enable basic survival, one might well fear for our situation. If ever it was a smart move to show genuine concern for the poor and to try to earn their patronage, it is now.